Titan Online Store Sale - Purchase Sonata Essentials White Dial Analog with Day and Date Watch for Men worth Rs.1375 at Rs.1100 Only. 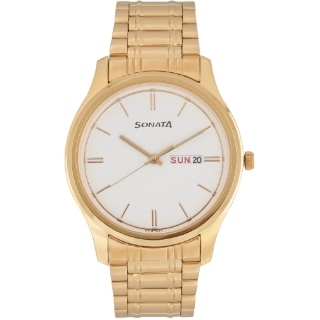 Mark another milestone in your life with this classic timepiece from the Sonata Essentials collection. Look dapper and elegant with this watch as you receive that much-awaited promotion. Crafted with a stylish white dial set against a gold stainless steel strap, this timer adds the right amount of suaveness to your look. Also get free shipping in India. All products on Titan store are original and go through strict quality check. Shop now!